Sniffs the ground and scratches itself. This companion is a rare tier Draenor Clans archaeology item. It is created by discovering and "solving" 175 Draenor Clans Archaeology Fragments. Players may utilize up to three Draenor Clan Orator Cane to aid in the solving of this item. Each Draenor Clan Orator Cane is the equivalent of 20 Draenor Clans Archaeology Fragments. 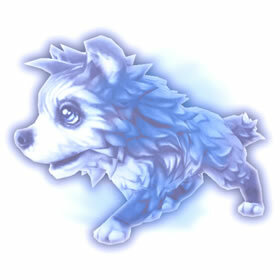 Once completed, an entry on the Frostwolf Ghostpup can be found in players' archaeology tab: "In life, no two creatures will share a stronger relationship than that of a Frostwolf orc and his or her companion wolf. The two eat, sleep, and fight side by side until one or both dies an honorable death. Even then, sometimes not even death itself can stop a frostwolf from coming to the aid of its beloved orc." Deals additional damage if the target is Blinded . I would advise Arcane Winds weather effect for this pet as Darkness would cut into your healing of Haunting Song. Additionally you could use Ghostly Bite without incurring a stun for one round. Expanding a Ponyheimer's comment, this pet IS the best AoE healer at once when it comes to full team – Haunting Song is stronger than Bleat (not to mention the other heals spread among shorter cooldowns) and this pet has a very decent attack power. But if you want to focus on other pets and not on active one, a Pygmy Cow has what you need. Regardless on that, this ghostly fella during the Celestial Tournament indeed goes quite well. And this howl is cute. For the love of all that is good and holy, don't buy this pet. It shouldn't cost the thousands of gold it does on the AH when it has a very decent chance of appearing as an Archaeology solve and can be obtained the moment you learn Archaeology. Some additional information: the Ghostpup, like all rare artifact projects, can be obtained only once per character (Not once per account) and this pet boasts an excellent breed with a skillset diverse enough to fit very well in many teams! She howls! Oh I love this pet! Got this after about 4 common on the archeology. Looking forward to trying him in battle. Just finished my rare artifact :D I love it! So stinking cute!!! Got him after my second solve! This little guy is so cute and his shimmer is really awesome too... My favorite new pet! got him really quick while leveling and doing arch. dawww. Just got mine today I'd say I got mine after 6 or 7 solves. I also started with around 40 Archeology in my skill. He's a neat little pet to have. I got this sweet little puppy on my 5th solve! He's so cute!! Got this baby on my fourth solve, he's definitely my new favorite. OMG. It's so adorable. I can't wait to level this little one. Seriously, apperance wise one of my favorite pets yet. One of my new favorite pets! 2nd solve, was so easy to get this cute little fella. Got this little guy on my second solve! Much easier to this time around since the number of surveys per location has doubled. Good luck and enjoy your new undead puppy! Took only 5 solves for me! I'm super happt it was so quick! This little cutie pie is the reason I will FINALLY level up my archeology!!! How adorable!!!!! The little wolf told to stay.rnWatching, waiting, for vacant prey.rnToo proud to leave, she slipped away.rnUnburdened now, forever free to play.